Scotland's only 5 Star Resin Bound and Bonded Contractor. We install resin bonded aggregate throughout Scotland, England, Wales and Ireland. SB Surfacing are fully SUDs complaint. Browse through our website and see the type of work we can do for your home or business premises. With a vast experience in resin bonded and artificial grass surfacing, you can be assured that you won't be disappointed with the end result. SB Surfacing has completed work at the Olympic Village in London successfully laying resin bonded surfacing. Sustainable drainage systems (SUDS) are drainage solutions that provide an alternative to the direct channelling of surface water through networks of pipes and sewers to nearby watercourses. Sustainable Urban Drainage Systems (SUDS) must be adopted as a result of the UK Government Legislation that came into effect in October 2008. SUDS are surface water and drainage management methods and devices designed to tackle the amount of excess water in a more sustainable and economical way, particularly in built-up areas to prevent flash flooding. The voids in the sub base retain water until it can drain naturally back into the water table, preventing flash flooding. Why use resin bonded surfacing? • SUDS = Sustainable drainage systems. 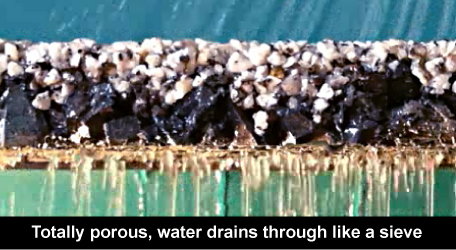 • Totally porous,water drains through like a sieve! • Slows water,so it flows naturally into water table. • No movement or cracking. • Eco friendly, uses recycled car tyres. • Attractive in a range of finishes.